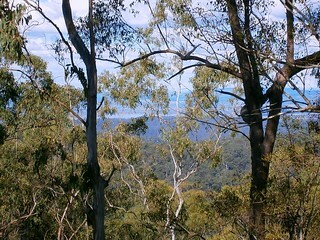 Lockyer National Park and State Forest is located in the hills north of Gatton, between Ipswich and Toowoomba. 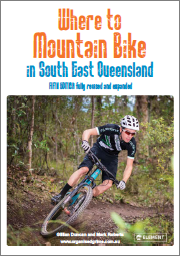 Gillian Duncan and Mark Roberts mentioned it in their excellent book “Where to Mountain Bike in South East Queensland” so I thought I’d check it out today on a solo ride. This was a “spur of the moment” ride. 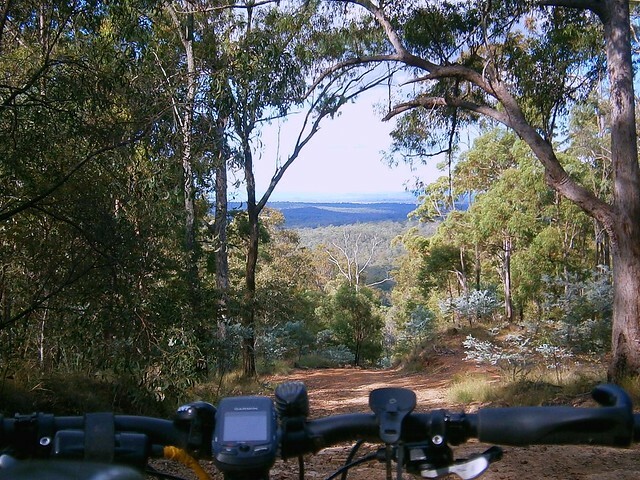 I woke up on Saturday morning without a plan, so I ended up picking a ride from the book that appealed to me, and set out rather late, not arriving at the trail head till about 11.30am. 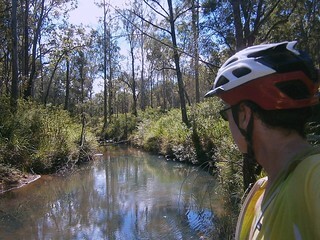 I started the ride at Millers Road on the corner of the Gatton-Esk Road. It has the distinction of passing by one of the newest prisons in Queensland. Rather than stop by this impressive looking Lockyer Valley resort, I slowly made my way up the red dusty road into the national park. 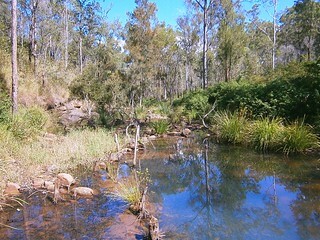 The road crosses Redbank Creek Several Times as it winds up the hill for 10km. So if you try this ride, be prepared to get your feet wet. 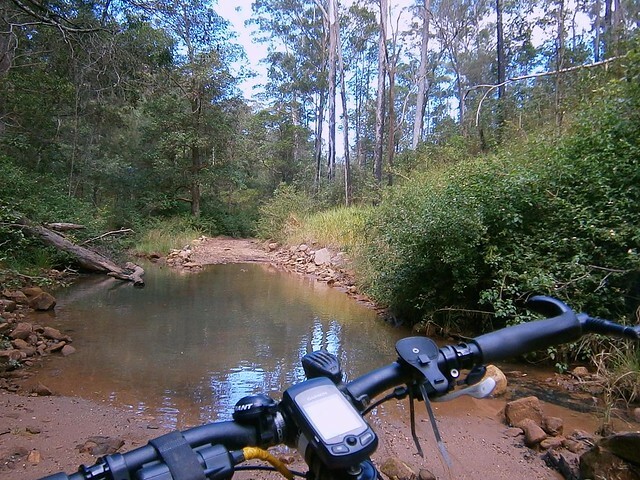 Today was hot (30C / 86F) so I didn’t mind cooling my toes in the water as I rode through. 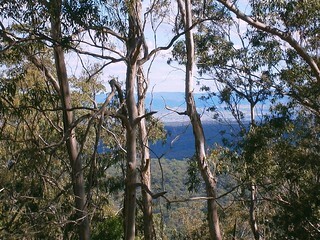 It’s a 10km climb and takes about an hour to ride to the highest point – about 550m above sea level. There are one or two parts that are quite steep – especially towards the end of the climb. 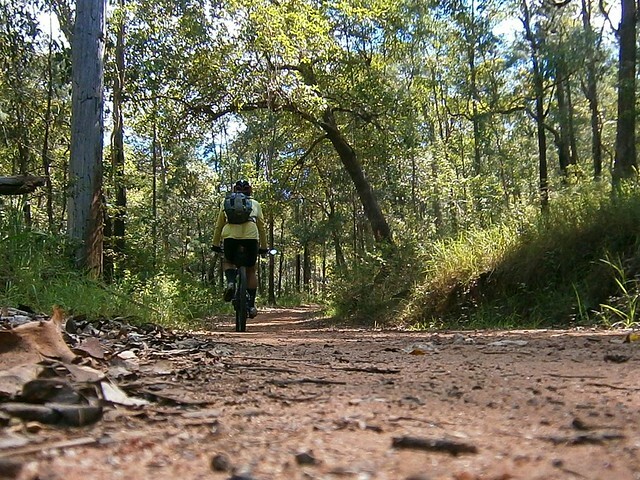 At the start of the climb, after crossing a few creeks, the road is quite dusty. This was a challenging combination as the water, sand and dust got on my chain making it crunchy and difficult to pedal. Luckily I always bring a rag and a bottle of chain lube in my backpack, and was able to give my chain a wipe down. At the top of the hill, I was able to look out over some of the lush farmland towards the D’Aguilar Ranges to the north-east. The ride down Wallers Road was a lot of fun. It starts as a gentle descent, getting steeper as you get towards the bottom. Apart from one short climb partway down, the whole descent is about 12km long. The steep bits towards the bottom are really enjoyable. They’re rocky with some loose gravel, and the gradient exceeds 30% in some places – it’s what mountain biking is all about. I had to hang my backside as far out over the back of the bike as I could and take a “controlled skid” over the rocks, trusting my wonderful suspension to smooth out most of the bumps. It was hard to stop smiling as I rode down. 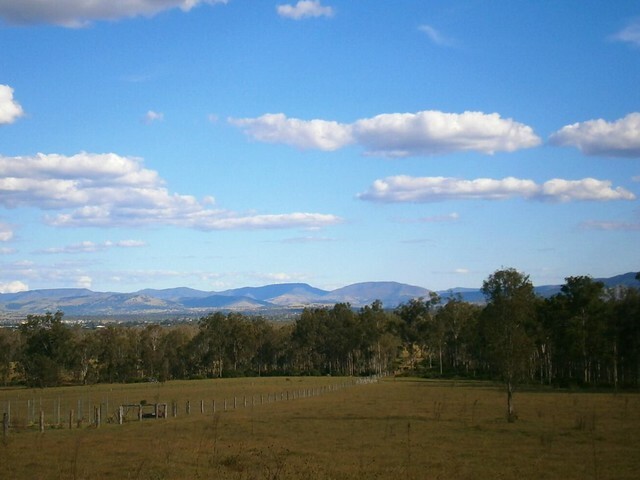 The last part of the ride was through some quiet back roads near Gatton with some spectacular views towards the Great Dividing Range to the South. 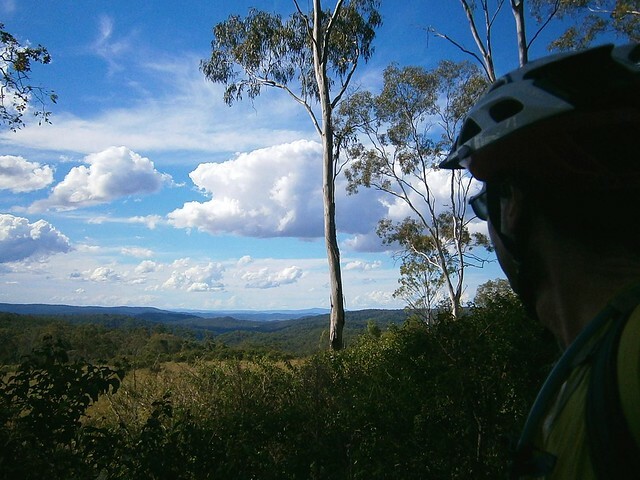 This ride was 45km with about 850m of vertical ascent. It took me 3 hours (excluding stops) and I burned 2,500kcal. I think it rates about 7.5 out of 10 on the tough-o-meter. 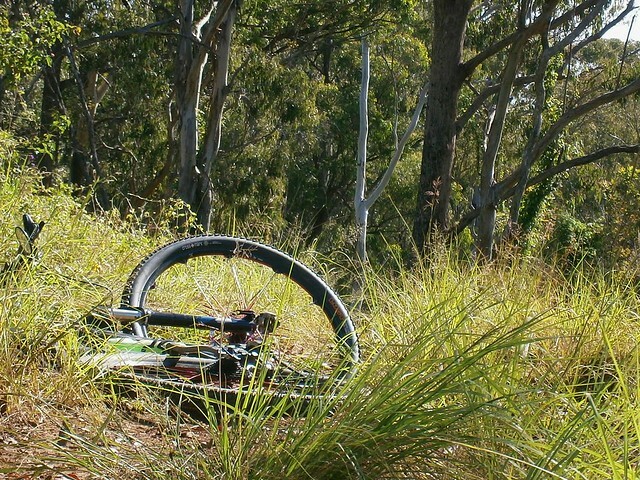 There’s a tough climb and a technical descent, but it’s an enjoyable ride. The only downside for me was having to do the last few km on the busy Gatton-Esk Road. 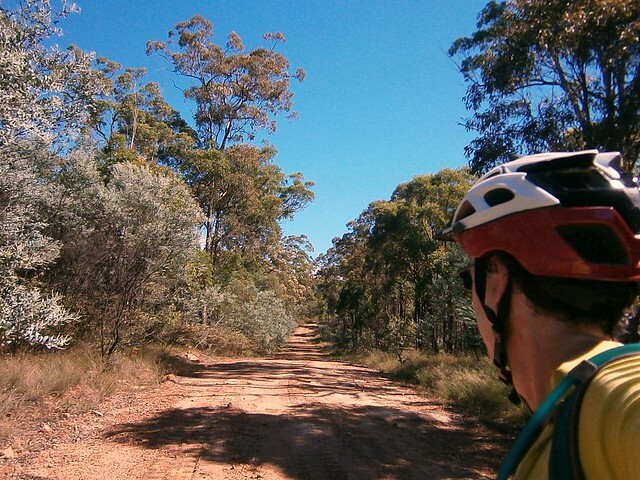 I might come back here again and see if I can eliminate some of the bitumen road towards the end – I think it would make an excellent social ride. 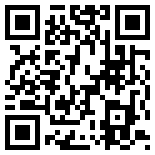 Allow 90 minutes if driving from the Brisbane CBD – or 2 hours from the Northern Suburbs. Great photos Neil, looks like an interesting route. I had discounted this ride due to the bitumen at the end as you said – so I will be intereseted to see if you come up with anything. So far, Google maps have not provided any options! There is a private property that hosts races at the end of Adare Rd. Perhaps you could contact them and ask to go though there. I haven’t looked on Google Maps recently, but my memory tells me there seemed to be tracks going from the property to the park. G’day Phil. I think I might be able to eliminate a lot of the bitumen on the south-east corner, but I’d still want to keep the last bit of the descent on Wallers Road – it’s a real hoot. I really enjoy reading this stuff Neil…. inspires me to explore.